PARISH priest Fr Neville Yun is preparing to live with just the clothes on his back when he heads on a mission trip to Indonesia this year. The parish priest at Holy Family Indooroopilly will spend two weeks with the Missionaries of the Poor, a religious order that take an extra vow of free service to the poor. Founded by Chinese-Jamaican priest Fr Richard Ho Lung, the Missionaries of the Poor is the fasting growing religious order in the world, with more than 600 priests, brothers and sisters who live for and with the poor. Their only possessions include religious habits, one pair of sandals, two pairs of working clothes, a crucifix, Rosary beads, one spiritual reading book and study notes. Fr Yun will also take up the challenge to leave his luxuries behind and live in poverty in the order’s Indonesia mission house, and is inviting others to join him. “I haven’t for a long time haven’t had that kind of experience going to a missionary country and living quite below one’s means,” Fr Yun said. 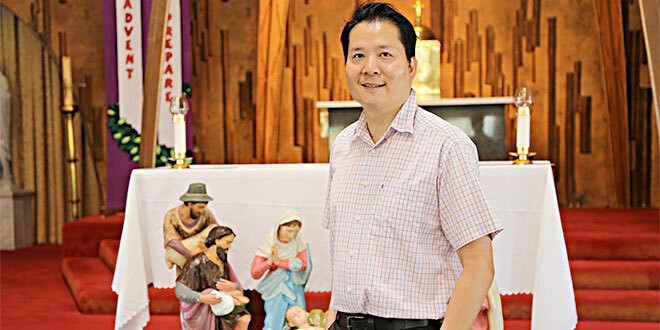 Fr Yun said he first heard about the MOPs from friend Louis Lamuri of his home parish in Sunnybank, and later discovered his Indooroopilly parishioners, Trevor and Tina Lambkin, were the Brisbane associates of the order. Both Mr Lamura and the Lambkins make regular visits to the Indonesian mission house, located in Ende, Flores in the Ruteng diocese, which cares for disabled children. Caring for the poor: The Missionaries of the Poor working in Ende, Flores in the Ruteng diocese. The missionaries, all religious brothers, give the children food and drink, clothing, shelter, basic medical care and spiritual nourishment including bible study and song worship, all at no cost. Like all MOP missions, the brothers in the Flores house do not take a salary or any payment for their services. Fr Yun said he would be the first priest outside of the order to visit the mission house. “They’re looking forward to just having a priest because I believe they haven’t had a priest come before,” he said. The challenge to live among the poor will, according to Fr Yun, help him and other pilgrims escape a “secular West mentality”. “If that can leave an imprint on us I think that’s a good thing,” he said. “(It will mean) we’ve learnt to be true pilgrims. The MOP immersion trip will be held from April 24 to May 4. There will be an information night on the Indonesian mission trip on January 28 at 10am at Morgan Howe Hall, Holy Family Church, Indooroopilly. For more information, contact the Indooroopilly parish on (07) 3371 7446. Is there a militant resurgence in Indonesia, the largest Muslim-majority nation?